Woolly bears and Tiger moths bear little resemblance to bears or tigers. Vague structural appearance and color pattern are the reasons for naming the two. Also the saying that,” Bear turns into Tiger” is nothing but a symbolic expression. Woolly bears are the most popular of all caterpillars in the world, may be because of their social influence, myths and their peculiar behavior. In Vermillion, Ohio, Woolly bear festival is held annually. Started in 1973, it is a family event where children, adults and pets wear furry costumes resembling woolly bears. In Beattyville, Kentucky, a similar festival, started in 1987, features people conducting woolly bear race. Woolly bear is called, by its thick fur like bristles. It is black at both ends and coppery red or orange in the middle. As it becomes older, closer to pupal stage, it turns completely orange red. According to an ancient belief, the wider the middle orange section is, the milder the coming winter will be. Conversely, a narrow band predicts harsh winter. Though there is no scientific proof, people in certain parts of the world still, have faith on woolly bears. 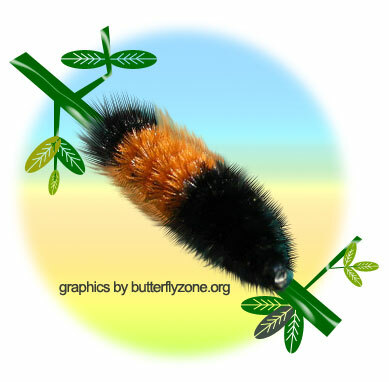 A woolly bear grows up to two inches in length. At the approach of winter, woolly bear stops eating, moves about in search of a safe spot to spend winter. It is at this time woolly bears appear in large numbers on the roads and highways and is the cause for the often asked question, “Why do woolly bears cross highways?” The answer is, the warm roads appeal to them. When touched by hand, the woolly bear will curl up into a ball and play dead. It is a means of protection from predators, during its cross country journey. On reaching a snug place, it coils up and spends the winter. Its fur coat acts as a natural sweater to bear the winter cold. During spring it returns to activity and spins a silky cocoon padded with its bristles. The cocoon is oval shaped and cream coloured.In about two weeks, the woolly bear pupa metamorphoses into a Tiger moth. The Tiger moth has a wing span of two inches. Its forewings are yellowish brown with rows of black dots and hind wings are slightly pinkish with rows of gray dots. The rows of dots on a yellowish brown surface bear a vague resemblance to the stripes of a tiger, hence the name, Tiger moth. The one or two weeks of woolly bear’s pupation, during which the sluggish woolly fur appearance changes into agile tiger stripes, is a metamorphosis wonder. The Bear indeed turns into a Tiger ! !